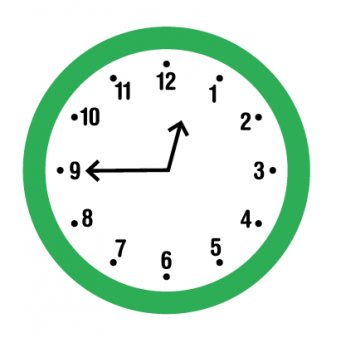 We explain how primary-school children are taught to use the 12-hour and 24-hour clock to tell the time on analogue and digital clocks, and how you can support their learning at home. The 12-hour clock runs from 1am to 12 noon and then from 1pm to 12 midnight. The 24-hour clock uses the numbers 00:00 to 23:59 (midnight is 00:00). In Year 2 they learn that there are 24 hours in a day, 60 minutes in an hour, and 30 minutes in half an hour. They move onto reading the time to the quarter hour and then the nearest five minutes. They also start to learn about time intervals (working out the length of time between two times). I put some lamb in the oven at 10.30 in the morning. I take it out at 11.20 the same morning. How long has it been in the oven? In Year 4, children need to convert between units of time (hour and minutes). They need to read, write and convert time between analogue and digital 12-hour and 24-hour clocks. I get the 13:46 train to Manchester, which takes exactly three hours and five minutes. How many minutes before 5pm do I arrive in Manchester? They could then convert the 24-hour clock time to 12-hour time, which would be 4:51pm. They should then be able to work out that they would arrive in Manchester 9 minutes before 5pm.